Cross-Post: This post was originally written by Alex Evans from Placeholder VC, and was originally published on their blog September 17, 2018, here. The vast majority of child networks resulting from chain forks are in disuse and have lost significant value relative to their parent networks. Despite lower use metrics, child networks trade at higher user and transaction value multiples (e.g., NVT ratio) than their parent networks. Users and developers tend to remain loyal to the original network, while most miners are loyal to economics only, directing hashpower to the most profitable network of the moment. Forks are as ubiquitous as they are misunderstood. To frame the debate on the role and value of forking, the aim of this article is to establish a factual baseline for the study of forks. To date, there have been hundreds of forks, but not all are equal. Broadly speaking, we can think of two types. There are chain forks, where the code, ledger, or both code and ledger of an operating blockchain are altered, creating a live cryptonetwork separate from the parent chain (which we sometimes refer to as a “child” chain in this piece). We can think of this as a partition of a live network. Then there are pure codebase forks, where the original cryptonetwork’s code repository is tweaked offline, before a release of a separate network with a new genesis block. Digging into chain forks, those that start solely with ledger alterations often end up diverging from the parent codebase, as in the case of Ethereum Classic (and, of course, vice versa). In chain forks where only the source code is altered, the state of the original cryptonetwork is replicated, entitling users with balances at the time of the fork to an equal amount (but not value) of assets in both networks. To date, Bitcoin is by far the most forked network, with at least 40 chain forks at various block heights (and likely more we’re not aware of). By our rough tabulations, Ethereum has also had at least 15 chain forks, and Monero at least 4. The vast majority of the resulting child networks appear to have no usage or value. Codebase forks are even more common than chain forks, with prominent protocols such as ZCash and Litecoin resulting from codebase forks of Bitcoin Core. These types of forks are much harder to define precisely as the codebases of most cryptocurrencies have some degree of shared DNA, but also evolve to look vastly different. The discussion below mostly focuses on chain forks of major networks, as opposed to pure codebase forks. We examine the behaviors of key network stakeholders during forking events — including users, developers, and miners — and attempt to study how their decisions drive value in the underlying networks. The focus is on the network and assets of Bitcoin (BTC), Ethereum (ETH), and Monero (XMR), each of which has at least one prominent child asset resulting from a chain fork. Zcash (ZEC) will also be considered in the analysis, shedding light on the proceedings of a codebase fork (Zclassic). How do users behave after a fork? It has been argued that forks are dilutive to the value of a cryptoasset as they split the user base (or demand side) between the parent and the child, resulting in a lower combined network value. Looking at Bitcoin, Ethereum, ZCash, and Monero, the idea that forks divert the demand side of the network from the main chain does not appear to hold true. Figure 1 illustrates this using daily active addresses and transaction volume as proxies for demand-side activity. Red lines indicate the approximate dates of a network fork (respectively, Bitcoin Cash, Ethereum Classic, ZClassic, and Monero Original and Monero Classic). The periods approximately cover the sixty days before and after each fork (with the exception of ZCash, as ZClassic was created soon after network launch). 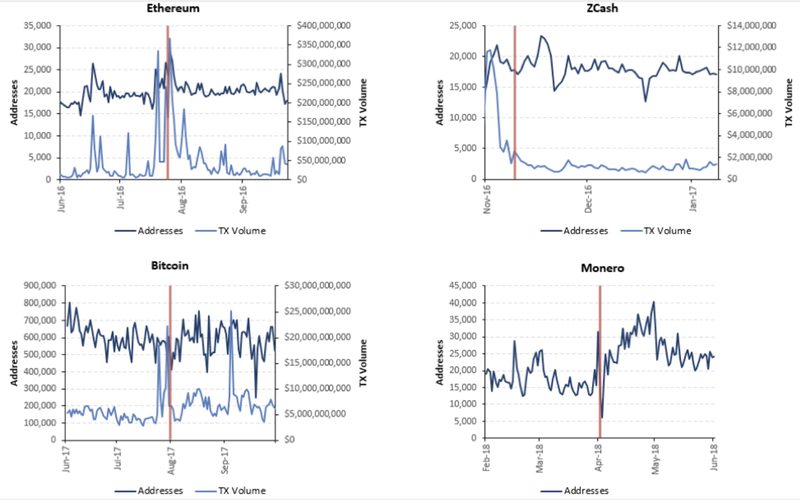 While we cannot observe the counterfactual, across the four networks the creation of a child chain does not appear to correlate with a decline in daily active users or transaction volume on the parent chain (note that data on Monero transaction volume was unavailable for this analysis). This holds even as the forks took place in different market environments and varied stages of network maturity. Rather than true community splits, forks of these networks appear to have created essentially new communities, something also apparent from the behavior of developers. How do protocol developers behave after a fork? The loyalty of users to the parent network is matched by that of core protocol developers. Comparing the top contributors of Bitcoin to Bitcoin Cash, Ethereum to Ethereum Classic, and ZCash to ZClassic, their corresponding developer communities diverge over time (note that the recency of the Monero forks precludes serious comparative analysis of the codebase). Following Azouvi et al’s work, I compute the Sorensen Dice coefficient for each network and its child. Plotting the coefficient over time (Figure 2), we see a clear divergence in the contributors beginning at the time of the fork (lower numbers imply less overlap in core developers). With the communities of top developers becoming increasingly heterogeneous, so too do the two codebases, independently evolving akin to allopatric speciation. It is important to note that this coefficient is a trailing indicator, as it takes time for new developers on the child chain to displace contributors in the top-30 in the original repository, as the two codebases are one prior to the fork. How do miners behave after a fork? Unlike users and developers, miners exhibit no discernable loyalty to an underlying chain; they behave like economic mercenaries, loyal only to profit. This is consistent with the hypothesis of an efficient mining market, which we explore by looking at a proxy for relative mining profitability. Following Kiffer et al’s work on the Ethereum/Ethereum Classic fork, I divide average daily difficulty by total revenue per block (block reward times average USD exchange rate per coin). This can (very roughly) be thought of as the number of hashes required per dollar of revenue. As seen in Figure 3, the charts for the main networks and their forks are almost identical. In other words, miners make the decision on which chain to mine based on daily exchange rates and difficulties of both chains, exhibiting highly efficient economic behavior in exploiting opportunities across networks. A few finer observations: While the numbers for Ethereum and Ethereum Classic are almost perfectly correlated, the ETH/ETC ratio has often diverged from 1 for extended periods in recent months, as shown in Figure 3b. We should expect differences between Ethereum and Ethereum Classic mining dynamics to become more pronounced as the roadmaps of the two projects continue to diverge. On October 16th 2017, Ethereum’s difficulty and issuance changed with the Byzantium hard fork (which we account for by adjusting the block reward to 3 from 5). Similarly, Ethereum Classic has recently implemented a hard fork to diffuse the difficulty time bomb and the Ethereum community is debating a further reduction in block reward. Over time, different approaches to consensus and miner incentivization between the two projects are expected to cause the ratios to diverge even further. On the other hand, starting in Q1 2018, Bitcoin and Bitcoin Cash have converged on a highly stable equilibrium, with the ratio settling into an efficient range with few sustained deviations from 1. The lower variance for Bitcoin and Bitcoin Cash may also be an indicator of greater professionalization of Bitcoin mining relative to that of Ethereum. Similarly, it may be influenced by the presence of a small number of entities with the majority of hashpower on both networks. What does all this mean for cryptonetwork value capture? It is often casually argued that network rents can be “forked away,” with value flowing to a less rent-seeking fork. While we lack sufficient evidence to confidently reject this hypothesis, early evidence points against it. Empirically, the vast majority of child chains are in disuse and have depreciated substantially relative to their parent chains. Even of the more well-known forks, such as Ethereum Classic and Bitcoin Cash, next to none have appreciated relative to the original networks. Of the more prominent chain forks listed on CoinMarketCap for Bitcoin, Ethereum, and Monero, all but one has lost value relative to their parents since the fork: Since initial trading, BCH is trading slightly lower than its initial price after the August 2018 hard fork, while BTC has appreciated 133%. Similarly, Bitcoin Gold has lost nearly 95% of its value since it forked from Bitcoin, while BTC has only lost a little over 30% in the same period. While ETC’s market cap was 7.3% that of ETH at launch and peaked near 19% in early 2017, it is now around 5%. Monero Classic and Monero Original have also underperformed XMR. Of the networks examined in detail in this post, the only asset that has appreciated relative to the parent chain is ZClassic, a codebase fork of ZCash with lower inflation due to the removal of the founder reward. Nonetheless, there doesn’t appear to be any real usage of ZClassic or any ongoing development of the project since February of 2018. 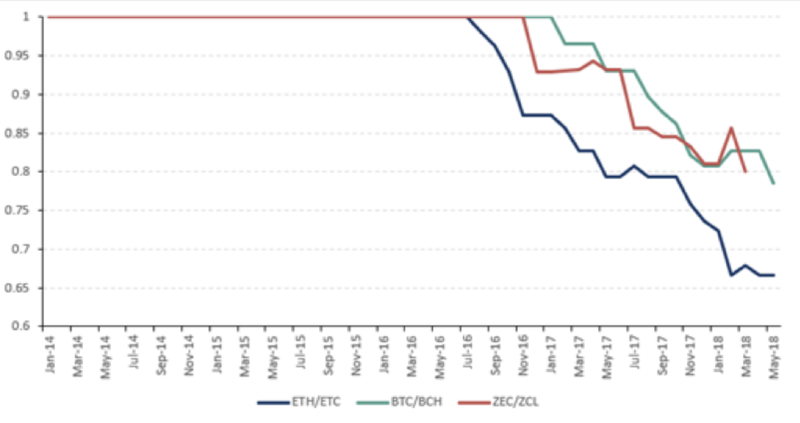 ZClassic experienced a speculative run-up in price at the start of this year, due to the Bitcoin Private “dividend” (Bitcoin Private is a chain fork of ZClassic, which is itself a code fork of ZCash, which started as a code fork of Bitcoin Core). After the hard fork, the price of the ZCL collapsed and development on ZClassic appears to have paused. Outside of major chains, PIVX has performed better than its parent, DASH. Overall, the observation that forked assets consistently underperform their parents runs contrary to the commonly articulated belief that value can easily be forked as users readily switch between networks. A good amount of this phenomenon could be attributed to the fact that forks have failed to attract users and core developers from the original chain and as such have to bootstrap a new community to compete, while the original chain retains its network effects. Unfortunately, it appears that we are too early in the history of these networks to rigorously evaluate this hypothesis. Divergences in the network value of parent and child chains present an interesting petri dish to further investigate relative valuation metrics, and how the market rationally prices cryptoassets based on their fundamentals (or not). Comparing network value to transaction value ratios (NVT Ratio) for BTC/BCH and ETH/ETC, using 90-day moving averages for transactions (Figure 4), reveals that the child chains often trade at a NVT premium to the original network assets. Trading at an NVT premium implies the market is valuing the child chains at a higher multiple of transaction value, a pattern which ETC and BCH have displayed relative to ETH and BTC, respectively. The premium cannot be explained by stronger growth, as both child chains have experienced anemic transaction growth, no higher than that of their parent chains. In the case of BCH, the premium is significant, with an NVT ratio 65% greater than that of BTC’s at the time of writing. To explore these divergences further, we turn to addresses. Ratios focusing on daily active addresses primarily involve Metcalfe’s law and its variants. As we are simply comparing between assets, the particular formulation is less important and, as such, we use the traditional n-squared formulation. Figure 5 summarizes the natural logarithm of the ratio of market cap and squared active address count for Bitcoin vs Bitcoin Cash as well as Ethereum vs Ethereum Classic. The results further accentuate the divergence from fundamentals, as both BCH and ETC trade at premiums to BTC and ETH based on this Network Value to Metcalfe’s law Ratio (NVM Ratio). The discrepancy for BCH is particularly striking. Arguably, both NVT and NVM are demand-side ratios that capture only one side of the network. Unfortunately, there has been little work on holistic models for cryptonetworks that would allow us to take a closer look at what is driving these divergences from implied fundamentals. The only two-sided framework I am aware of that attempts to build a composite measure is that of Buraschi & Pagnotta, who develop a model where price and hashrate are jointly determined in equilibrium. Figure 6 fits hashrate and active addresses to this model using the parameters specified by the authors (see pp 19–20) and 30-day moving averages for asset supply and hashrate. Leaving aside a statistical exploration of the fit, we can informally observe that the model does a much better job explaining BTC than BCH price. Using the same parameters for the Bitcoin Cash network, however, the BCH price far exceeds that predicted by the model. In theory, the similarity between child and parent networks would lead one to expect them to trade in close relative valuation ranges. While the numbers are still rough, and more data is needed, early indications point to child chains consistently trading at relative valuation premiums when compared to the parent. A few possible explanations for this phenomenon are as follows. First, many holders don’t move the child asset, instead leaving it untouched until they choose to claim it at a later date, which means there is less selling pressure than would otherwise be expected and hence the price stays unnaturally elevated. Secondly, investors often perceive the child chain as insurance to the parent unraveling, and thus hold more of that asset for investment purposes than would be otherwise expected from the fundamentals. Third, the parent chain “anchors” the value of the child at a higher level than that implicitly justified by the fundamentals. At present, we lack sufficient data to further evaluate the merit of these hypotheses. While we are still in the early days of understanding the consequences of cryptonetwork forks, a few tentative patterns have begun to emerge. Contrary to the narrative of frictionless forking sucking value away from large networks, child chains to date have struggled to attract demand and developer talent from their parent communities. We can speculate that the inability of almost any child chain to meaningfully appreciate relative to its parent may result from this difficulty of diverting users and developers from parent networks. That said, child chains often trade at relative valuation premiums when compared with parents. While the short history of major network forks precludes more confident assertions, we intend to use this study as a baseline to revisit the economic dynamics of forking as more data becomes available. Sorensen Dice is a measure of population heterogeneity commonly used in ecology. Here, it is computed by taking two times the number of common contributors in the set of top 30 contributors for each codebase (ranked by total number of commits) and dividing by the total number of contributors in both sets (i.e. 60). Two finer points are worth noting in the results. First, ZCash itself has a non-zero Sorensen-Dice coefficient with Bitcoin and Bitcoin Cash, as the project also started as a fork of Bitcoin Core. Second, ZClassic is still technically a branch of the main ZCash codebase on Github and independent development appears to have all but halted as of March 2018, with some development migrating to a second hard fork, Bitcoin Private. Second, while ETC’s and ZCL’s top contributors diverge from the original developer community after their respective hard forks, the contributors to Bitcoin Cash and Bitcoin-ABC’s codebases diverge in advance of the hard fork on August 1st 2017, as work on the client had started earlier in the year (evidenced by the dates of this thread and this github post). In this model, price is determined by investors choosing to purchase a decentralized network asset that can be exchanged for future network services. Future value of those services depends on the product of expected future users (with value given by Metcalfe’s law) and the probability of network failure (that is decreasing as a function of current network hashrate). While there are several limitations to the model, it is, to my knowledge, the only one that attempts to bring together both supply and demand factors and explicitly models a two-way relationship between price and hashrate.